The endolymphatic shunt is used by some doctors who treat Meniere's. The logic behind it is that by placing a drain in the endolymphatic compartment, it may relieve pressure in the inner ear causing hydrops. It involves opening up the endolymphatic sac, with the thought that this may reduce pressure in the inner ear. Generally, opening up the sac also does damage to the sac, so this procedure may actually just be a method of damaging the sac (see below). 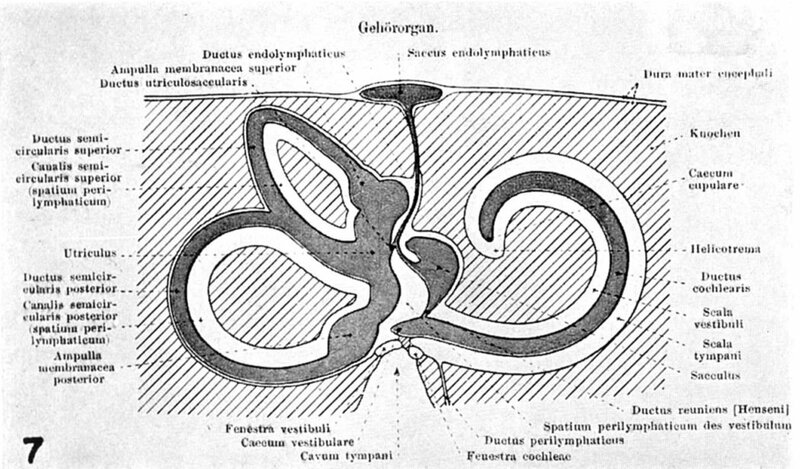 The anatomy of the endolymphatic compartment is shown here. Shunts are often recommended by otologic surgeons (Kim et al, 2005). Unfortunately, while the shunt would seem to be a logical thing to do, in most studies, the shunt procedure does not appear to be better than doing nothing (e.g. Silverstein and Rosenberg, 1992), or doing a sham (placebo) surgery (Bretlau et al, 1981; Thomsen et al, 1981, see references below). This lack of effect may be because the shunt can easily get plugged up, because what it is treating (hydrops) is a symptom itself rather than a cause of symptoms, or because the whole concept of the sac being a drain is just wrong. We favor the first and third explanations. Similar to shunt surgery is endolymphatic sac decompression surgery. This is a process where an ear surgeon drills bone around the area of the sac in the mastoid bone. Not very different than mastoidectomy. Again, we advise against this surgical procedure. 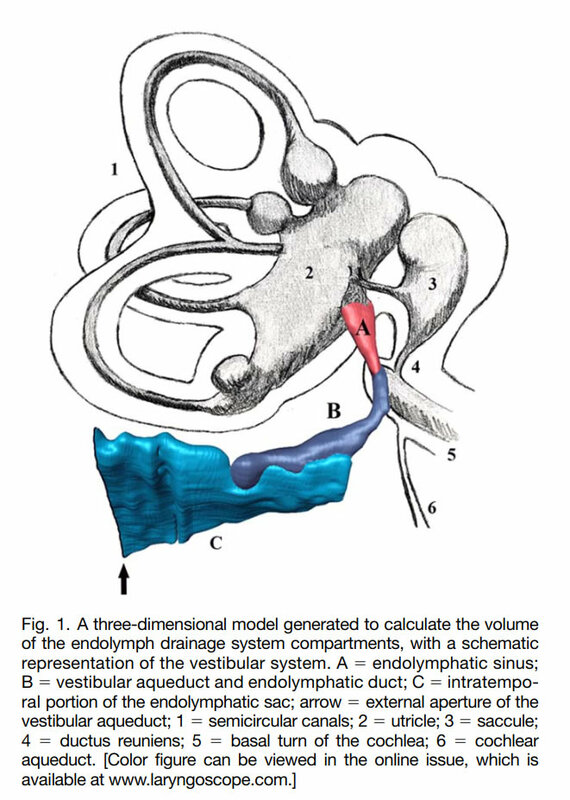 Interestingly, another surgeon reported good results in Meniere's with endolymphatic duct BLOCKING surgery (Saliba et al, 2015). Of course, it is difficult to see why blocking the duct would have the same good results as opening the duct. The only surgical activity common to both shunts and duct blocking is the mastoidectomy. Saliba recently published about CSF leaks in these patients (2018), but we are still waiting for another group to replicate this study. Perhaps the most influential study concerning shunts for Meniere's was the "Danish Sham Study". This was first published in 1981 (Thomsen et al. ), and was followed up by 6 other papers (by the same authors, listed below). In the Danish Sham study, 30 patients were randomized into shunt vs. mastoidectomy. In the mastoidectomy group, the bone behind the ear was opened up (mastoid sinus -- mastoidectomy), but the inner ear was not entered. In the shunt group, there was both a mastoidectomy as well as insertion of a plastic tube ("shunt") into the endolymphatic sac through a hole in the bone. Both groups -- mastoidectomy and mastoidectomy+shunt, did equally well, even as far as 9 years later (1989). The authors of the Danish Sham Study considered the mastoidectomy a placebo. If one accepts this statement, then it would follow that shunt surgery is equally effective to placebo, and that there is no reason to propose shunt surgery to patients with Meniere's. Other viewpoints on the study include the conjecture that both mastoidectomy AND shunts are "active treatment". Both involve drilling around the bone of the mastoid, and perhaps this is sufficiently destructive that it helps Meniere's. If one follows this train of thought to the logical conclusion, there is no need to do a shunt -- a mastoidectomy is enough. It would also follow that surgical procedures such as "duct blocking" (e.g. Saliba et al, 2015) see above, at their business end, are mastoidectomies. Welling and Nagaraja (2000) attempted to refute the sham study through a reanalysis of the data from the original study. They concluded that Thomsen and associates did their statistics incorectly, and actually shunts did work better than mastoidectomy. It is difficult to follow this paper and we are not sure who is right. Another attack on the general conclusion that shunts are placebos, and that the observed effect was a placebo effect, has to do with the observation that only 30 patients were studied. Perhaps by chance, the two groups of patients were destined to do well. It is well accepted that Meniere's is a very variable disorder, and that large numbers of patients are required to develop a reasonable conclusion (e.g. Ruckenstein et al, 1991). So this argument could be true. Bottom Line regarding Endolymphatic Shunts for Meniere's disease. We do not presently recommend shunts (or variants) for our Meniere's patients except in very unusual situations. These may include a person who has perfectly normal hearing but dangerous attacks of vertigo, or an older person who might not tolerate the gentamicin procedure (Pensak and Friedman, 1998; Gianoli et al, 1998). Bretlau P, J Thomsen, M Tos and NJ Johnsen (1982). "Placebo effect in surgery for Meniere's disease. A double-blind placebo-controlled study on endolymphatic sac shunt surgery." Adv Otorhinolaryngol 28: 139-46. Bretlau P, J Thomsen, M Tos and NJ Johnsen (1984). "Placebo effect in surgery for Meniere's disease: a three-year follow-up study of patients in a double blind placebo controlled study on endolymphatic sac shunt surgery." Am J Otol 5(6): 558-61. Bretlau P, J Thomsen, M Tos and NJ Johnsen (1989). "Placebo effect in surgery for Meniere's disease: nine-year follow-up." Am J Otol 10(4): 259-61. Doyle, K. J., C. Bauch, R. Battista, et al. (2004). "Intratympanic steroid treatment: a review." Otol Neurotol25(6): 1034-9. Kim HH, Wiet RJ, Battista RA. Trends in the diagnosis and the management of Meniere's disease: results of a survey. Otolaryngol Head Neck Surg. 2005 May;132(5):722-6. Ruckenstein MJ, Rutka JA and Hawke M (1991). "The treatment of Meniere's disease: Torok revisited." Laryngoscope 101(2): 211-8. Saliba, I., et al. (2015). "Endolymphatic Duct Blockage: A Randomized Controlled Trial of a Novel Surgical Technique for Meniere's Disease Treatment." Otolaryngol Head Neck Surg 152(1): 122-129. Saliba I, Asmar MH. Endolymphatic duct blockage for refractory Ménière's disease: assessment of intraoperative CSF leak on short-term surgical outcomes. Acta Otolaryngol. 2018 Jul 17:1-7. doi: 10.1080/00016489.2018.1481524. Spalteholz, W. 1914. Handatlas der Anatomie des Menschen, 7th ed. Verlak von S. Hirzell. Leipzig. Thomsen, J., et al. (1981). "Placebo effect in surgery for Meniere's disease. A double-blind, placebo-controlled study on endolymphatic sac shunt surgery." Arch Otolaryngol 107(5): 271-277. The Thomsen, J., et al. (1981). "Meniere's disease: endolymphatic sac decompression compared with sham (placebo) decompression." Ann N Y Acad Sci 374: 820-830. Thomsen J, P Bretlau, M Tos and NJ Johnsen (1983). "Meniere's disease: a 3-year follow-up of patients in a double-blind placebo-controlled study on endolymphatic sac shunt surgery." Adv Otorhinolaryngol 30: 350-4. Thomsen, J., et al. (1983). "Placebo effect in surgery for Meniere's disease: three-year follow-up." Otolaryngol Head Neck Surg 91(2): 183-186. Thomsen, J., K. Sass, et al. (2005). "Local overpressure treatment reduces vestibular symptoms in patients with Meniere's disease: a clinical, randomized, multicenter, double-blind, placebo-controlled study." Otol Neurotol26(1): 68-73. Welling, D. B. and H. N. Nagaraja (2000). "Endolymphatic mastoid shunt: a reevaluation of efficacy." Otolaryngol Head Neck Surg 122(3): 340-345.